Last year was the first time we really tried to put in a garden. I did no reading at all, bought some “top soil” from Lowe’s, tilled a corner of the yard tucked behind the garage under a tree and… yeah. It didn’t do great. Go figure. This year, I did some actual reading first. 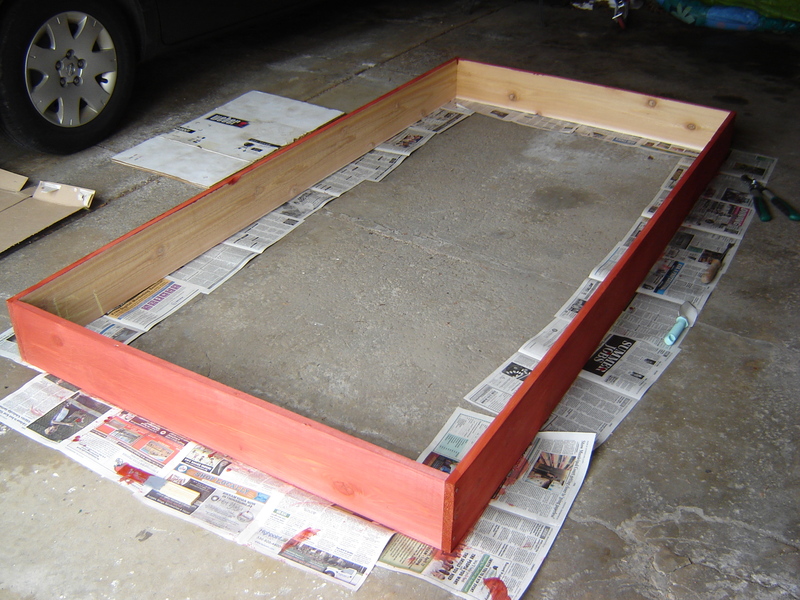 One topic I kept coming across was raised garden beds. The main advantages are better drainage (in wet areas) and easier to setup (vs tilling hard soil/clay). I wanted to get the garden out into the middle of the yard, but it’s swampy whenever there’s a decent rain. 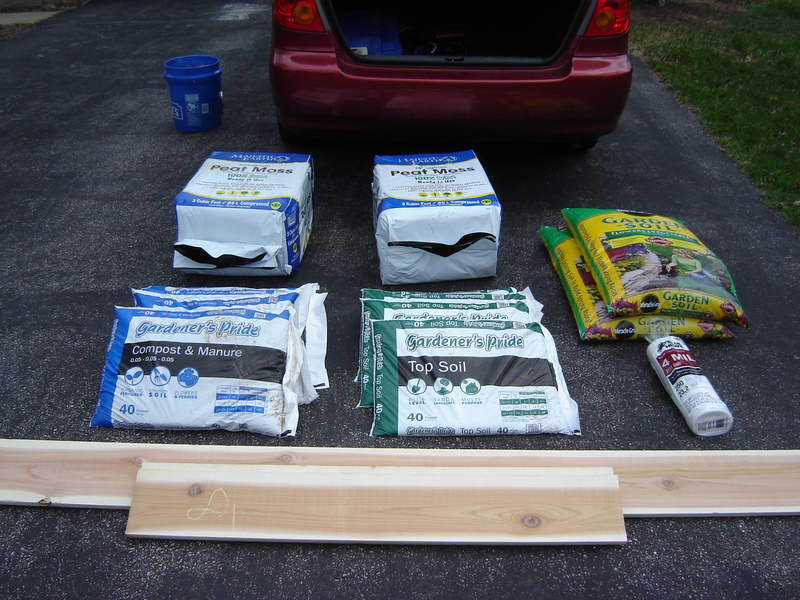 An hour or so at Lowe’s and I had everything I needed. 2 pkgs Sphagnum Peat Moss – Might’ve went overboard. Helps retain moisture. 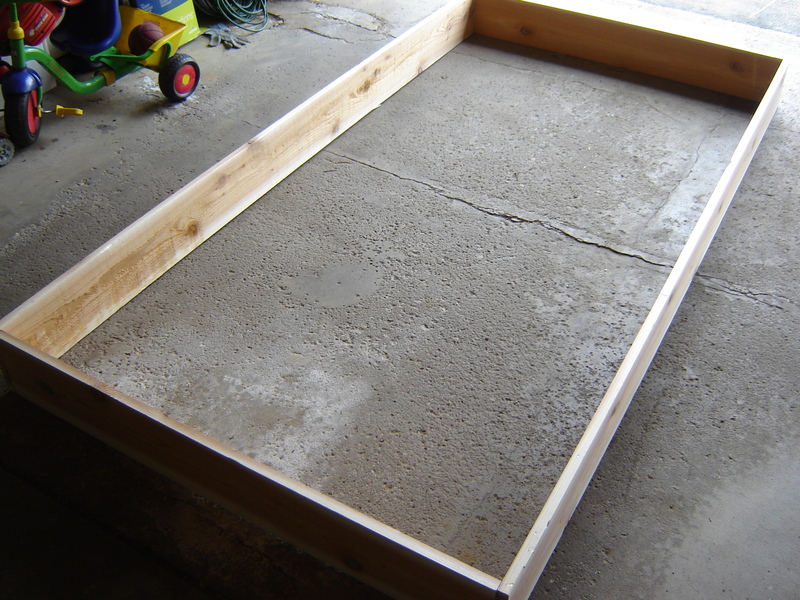 One thing most gardeners seem to agree on is staying away from pressure-treated lumber for vegetable gardens. Although they don’t use arsenic / cca in residential PT wood anymore, there’s still concern about chemicals leeching into the ground where your food’s growing. Cedar, redwood, and a few others are especially rot and insect resistant. The box was fairly easy to assemble. Picked a relatively flat surface. 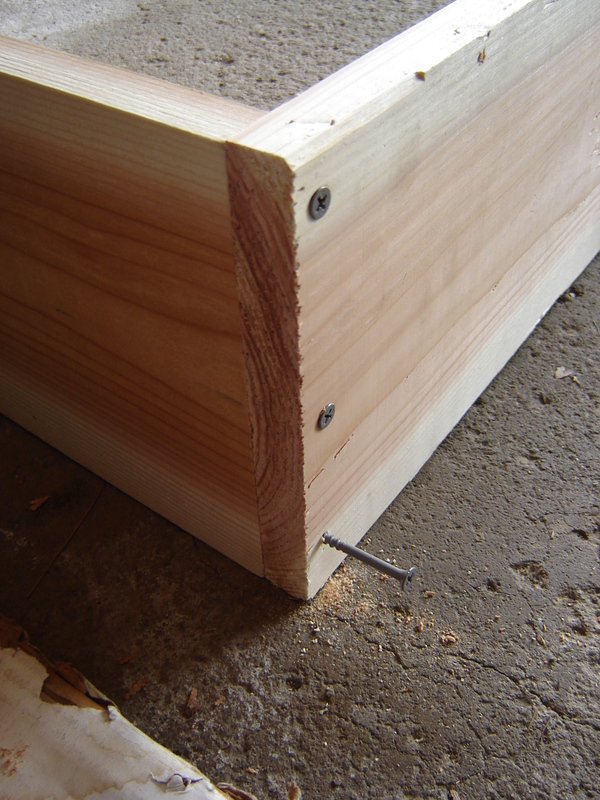 Three long, galvanized screws to each corner. I applied a redwood stain left-over from another project. Just to the outside though, to minimize contact with the plants. The cedar has a nice natural color, but kinda looked unfinished. I’m also hoping the stain helps the wood last longer. Although cedar is rot resistant, it can’t be great to have it sitting directly on the ground, in constant contact with mud. I wouldn't recommend this step anymore (see May 13 update). Here’s the finished product (sans vegetables). I used all the dirt I purchased (but only one bag of plain top soil, on the bottom), and just kinda switched between the different types, mixing them up and smoothing things out as I went. I meant to place a few layers of newspapers on the bottom to prevent weeds, as some suggested doing, but forgot. 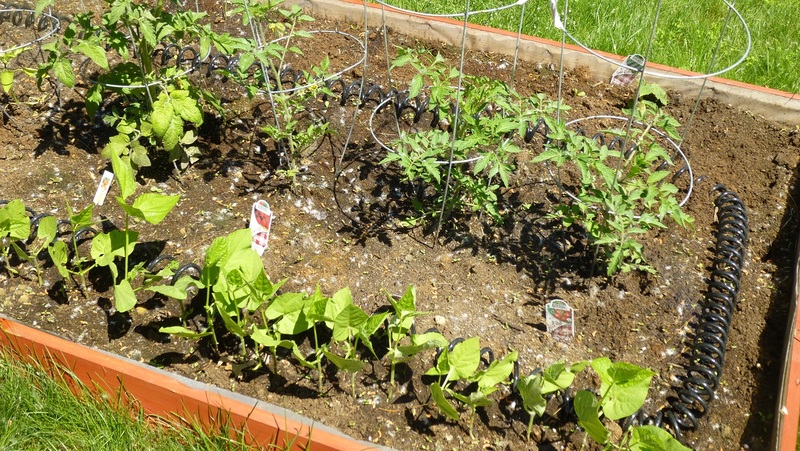 I threw in a few wire tresses we used last year for tomatoes, beans and the like. Glad I didn’t plant vegetables yet, since we had a freak snowstorm this morning. That’s Ohio. Things should warm up by the end of the week, and then I’ll buy some sprigs to plant (I have issues with delayed gratification). We bought some tomato plants when they were still small, but already started. Then added beans, carrots, etc. 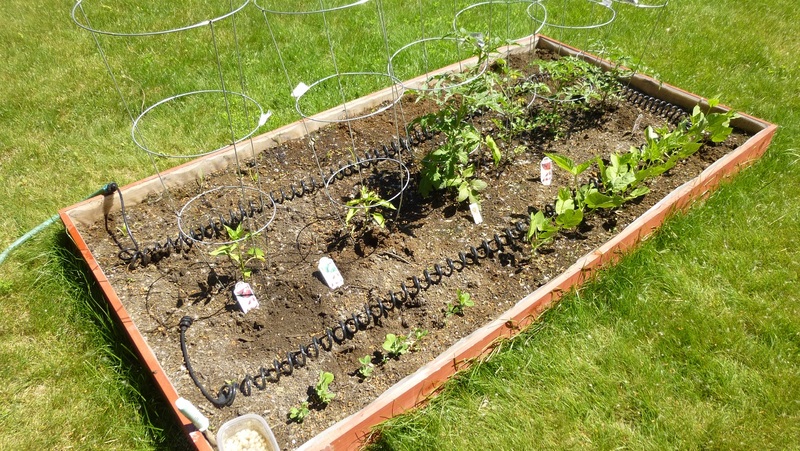 Also added a soaker hose ($7 – gotta love Marc’s), which we usually leave on for awhile once a day. Probably more as we get into July and August and things really heat up. It worked out really well this summer. 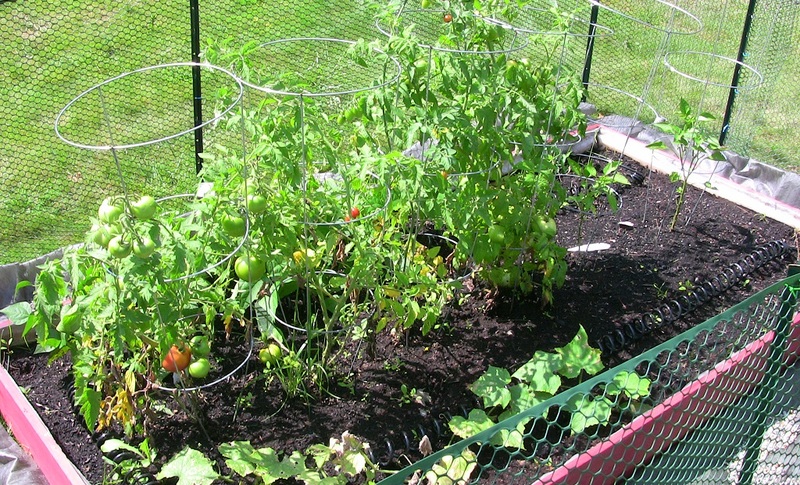 I ended up having to put up a plastic fence around it once the vegetables started ripening up… we’ve got a few rabbits around. You'll want at least 32 feet or so to go around the box with enough room for you to walk. 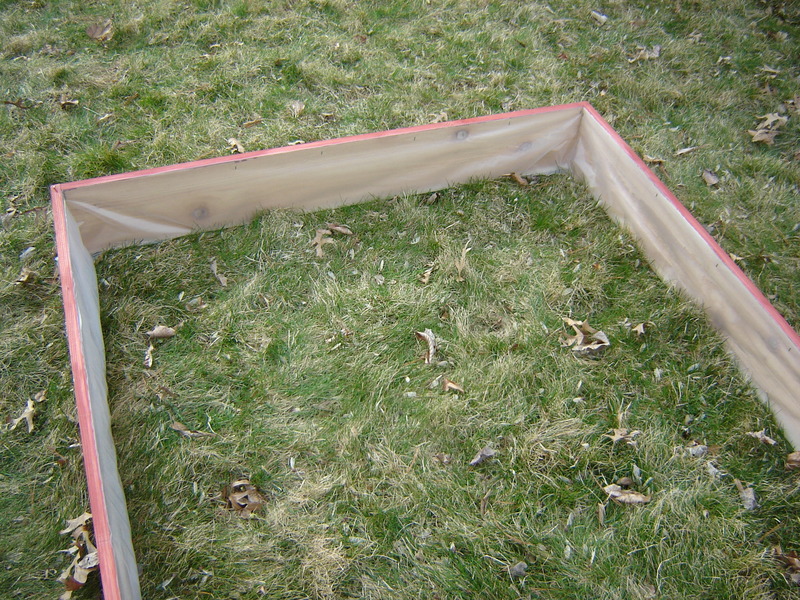 I bought a 50-foot roll and left the extra rolled up inside the enclosure, since I'm planning on making a second box next year. 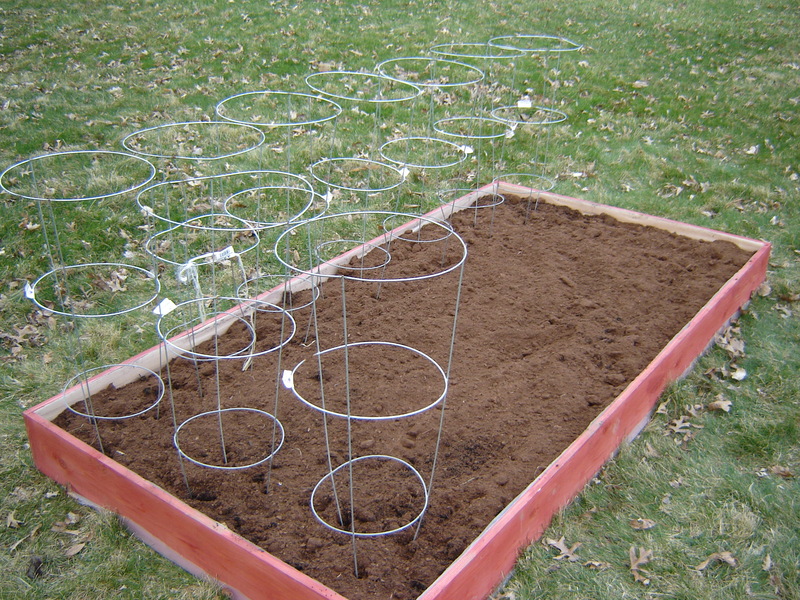 You'll need to get some stakes to attach it to (I opted for metal posts), then place them a few feet apart. Wrap the fence around the garden and attach it to all the posts except one. 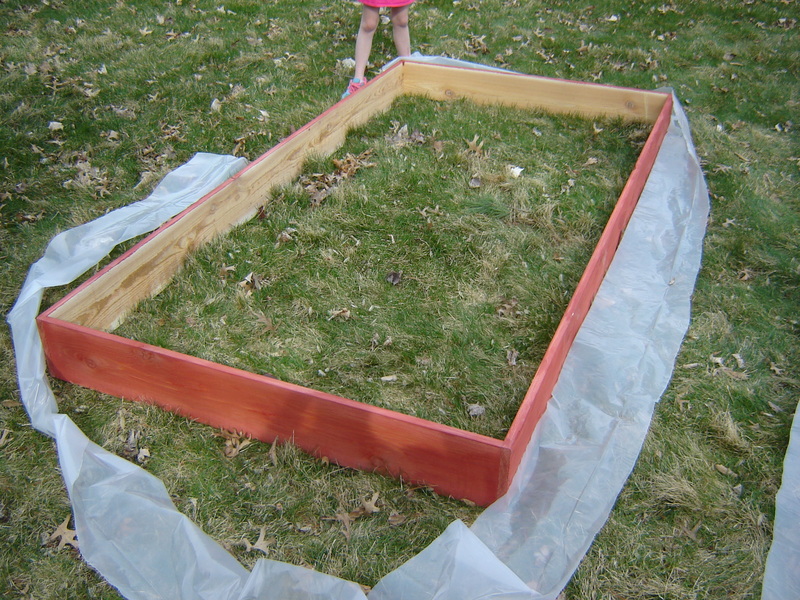 Make sure the fence ends at the corner of the garden where that last post is, and use a tiny bungee cord to create a "door" so you can get in the garden easily. 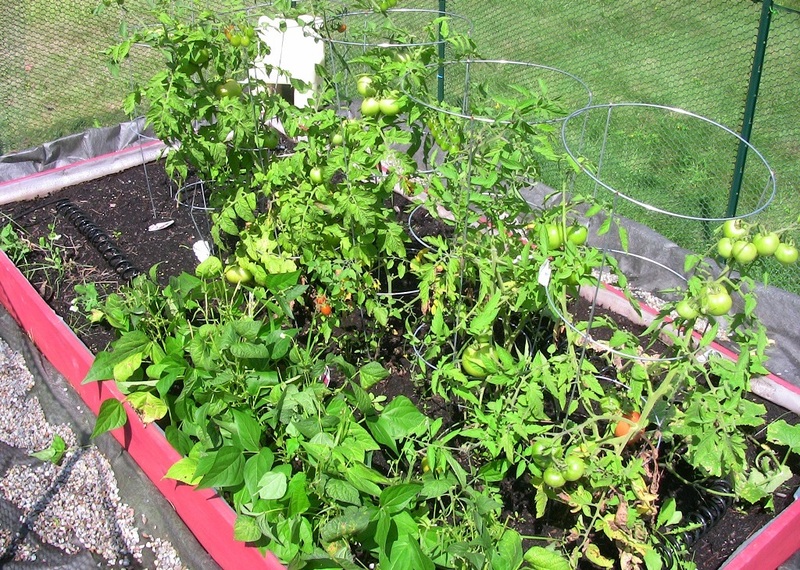 Got tons of green beans, plenty of tomatoes, and some peas and cucumbers too. Peppers got nibbled on (before the fence) so some small ones are starting to grow but no way they’ll make it in time. Still going. Haven't had to replace any boards yet! In 2015 I added another box and extended the 50-foot fence around it. It worked out really well. The plastic on the inside of the box was a mistake. It began crumbling the following year and I finally ripped it out today. I assume the elements were just tough on it. The cedar boards look fine even where they weren't covered in plastic.